#MLA15 Sinophone Scholars! 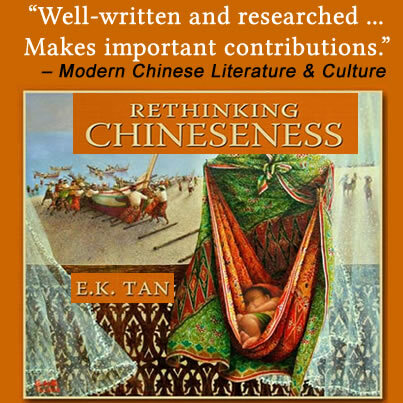 Must-have book praised by world’s top Sinologists! Browse Rethinking Chineseness: Translational Sinophone Identities in the Nanyang Literary World by E .K. Tan, associate professor of comparative literature and cultural studies at SUNY Stony Brook, at the Cambria Press booth (402) in the #MLA15 book exhibit hall and enter our #MLA15 book-giveaway draw for a chance to win this book, which is in the Cambria Sinophone World Series headed by Victor Mair (University of Pennsylvania). Dr. Tan will be participating in the #MLA15 session Mapping Literature and Linguistics: The Politics of Place and History in Malaysia and Singapore (Sunday at 1:45 p.m). LIKE Cambria Press on Facebook and follow Cambria Press on Twitter to stay updated on exciting news. Visit the Cambria Press website.